Congratulations to our latest winners of the 'Wish you were here' award, The Castle Hotel in Taunton. Every fortnight Guestline select a property that stands out from the crowd in our 'Wish you were here' campaign. Run by the Chapman family for more than 60 years, The Castle has, in this time, become renowned for the warmth of its hospitality and the excellence of its kitchens and holds many awards.The Castle offers 44 comfortable hotel rooms with free WiFi throughout. The Castle Hotel has a rich and vibrant history. Once a Norman fortress, The Castle has been welcoming travellers since the 12th century and is one of Taunton’s most famous landmarks. The building incorporates Castle Bow a Grade I listed building which originally formed the east gate to the Castle precincts. It still has 13th century chamfered arches, and corner buttresses with setoffs. The Castle is home to The Castle Bow Restaurant, Head Chef, Liam Finnegan is passionate about using fresh, local ingredients. So much so, that he grows some of his own herbs in the Norman garden at the castle. A big well done to all of the team, a truly fantastic property! 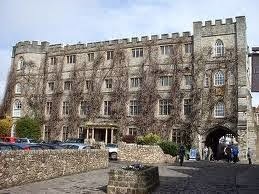 No stay in Taunton would be complete without experiencing the Castle Hotel, Taunton - Guaranteed lowest rates online! Enjoy your experience and visit to Taunton.